We hadn’t heard about this film before, so we figure it needs every little bit of help it can get. I expect you’ll only be able to find it in tiny little art cinemas though when it’s released in December. Here’s the synopsis: ‘In Lucasfilm’s Star Wars: The Last Jedi, the Skywalker saga continues as the heroes of The Force Awakens join the galactic legends in an epic adventure that unlocks age-old mysteries of the Force and shocking revelations of the past. With Disney busy showing off its wares at the D23 Expo at Disneyland, one of the big things they’re hawking is, of course, Star Wars: The Last Jedi. To help get us excited for the next adventures of Rey, Finn, Poe, Luke Skywalker and co., a new behind-the scenes look has been released. If you were hoping for the first trailer for Star Wars: The Last Jedi to give you a full rundown of the plot, you’ll be disappointed. Instead – and as most expected – it’s more about teasing the movie and getting people excited. 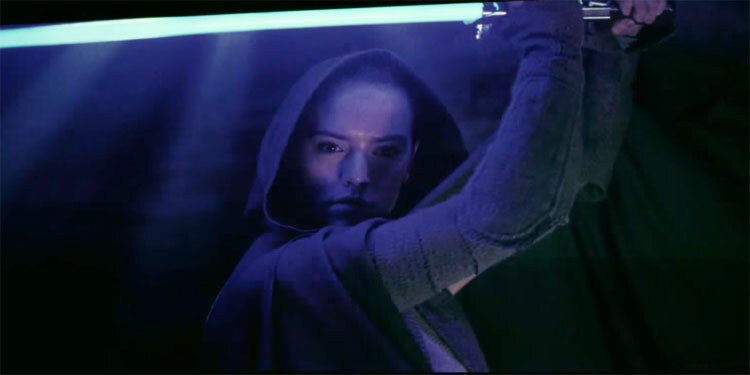 Plot-wise, all we learn is the Rey will be practicing her Jedi skills and that the bad guys think the Jedi should end. Nothing too surprising there then! It does all look pretty cool though, with the return of Finn, Poe and Rey, as well as a glimpse of Leia and the voice of Luke Skywalker. There’s also plenty of drama, Kylo Ren looking suitable evil, and som spaceship action. The excitement around Star Wars: The Force Awakens is already causing cinema websites to break under the weight of people trying to book tickets, and just in case there was anyone who wasn’t already planning to go, a final trailer has arrived. It certainly looks cool, mixing the old and the new, and it appears director JJ Abrams hasn’t given up on his beloved lens flare just because he’s in a galaxy far, far away. Here’s the synopsis: ‘Lucasfilm and visionary director J.J. Abrams join forces to take you back again to a galaxy far, far away as Star Wars returns to the big screen with Star Wars: The Force Awakens. It wasn’t expected until tomorrow, but the official main poster for Star Wars: The Force Awakens has arrived, which is bound to have fans poring over it, trying to unpick what it says about the characters old and new, from Han Solo and Princess Leia to John Boyega’s Finn and Daisy Ridley’s Rey. ‘Lucasfilm and visionary director J.J. Abrams join forces to take you back again to a galaxy far, far away as Star Wars returns to the big screen with Star Wars: The Force Awakens. The movie is out December 17th. Indeed, it was Ford’s first public appearance since his plane crash earlier this year, ensuring he got extra special cheers. JJ Abrams has been keeping very quiet about the cast for Star Wars Episode VII, but with the shoot starting to gear up and the likes of Harrison Ford, Mark Hamill & Carrie Fisher seen in London, many presumed we’d find out who would be in the film on Star Wars Day, May 4th. However it’s come sooner that that with Lucasfilm & Disney issuing the following release: ‘The Star Wars team is thrilled to announce the cast of Star Wars: Episode VII. ‘Actors John Boyega, Daisy Ridley, Adam Driver, Oscar Isaac, Andy Serkis, Domhnall Gleeson and Max von Sydow will join the original stars of the saga, Harrison Ford, Carrie Fisher, Mark Hamill, Anthony Daniels, Peter Mayhew and Kenny Baker in the new film. There’s no news on who the new cast will play, although it’s believed Attack The Block’s Boyega will be a Jedi apprentice, while Girls’ Adam Driver is one of the main villains. It’s a fair bet that Andy Serkis will be playing a motion capture character, but it’s less clear what Inside Llewyn Davis’ Oscar Isaac, About Time’s Domhnall Gleeson or relative newcomer Daisy Ridley will be doing. Along with the release came the pick above from a cast script reading. When Disney bought Lucasfilm they announced Star Wars Episode VII would come in 2015. Now it seems they’re firming up plans, with producer Bryan Burk revealing to Collider, during an interview for Star Trek Into Darkness, that the plan is to shoot early next year. Rumours last week suggested it would shoot in the UK, but Burk’s comments suggest that hasn’t been set in stone. Wherever it films, Mark Hamill, Harrison Ford, and Carrie Fisher should all return, so we can catch up with their characters after Return Of The Jedi.